Lily Collins Shares Behind-The-Scenes Pics From Fantine's Transformation From Start To Finish in 'Les Miserables' - Just Jared Jr.
Lily Collins Says Playing Fantine in 'Les Miserables' Was a 'Bucket List' Thing For Her - Just Jared Jr.
Fantine is a fictional character in Victor Hugo's 1862 novel Les Misérables. She is a young orphaned grisette in Paris who becomes pregnant by a rich student. After he abandons her, she is forced to look after their child, Cosette, on her own. Originally a pretty and naïve girl, Fantine is eventually forced by circumstances to become a prostitute, selling her hair and front teeth, losing her beauty and health. The money she earns is sent to support her daughter. 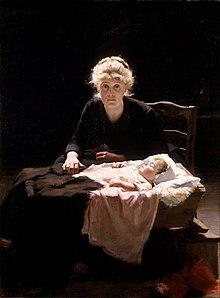 Fantine became an archetype of self-abnegation and devoted motherhood. Possibly due to her status as an orphan, Hugo never labels her with a surname. She has been portrayed by many actresses in stage and screen versions of the story and has been depicted in works of art. Performed by Hugh Jackman and Anne Hathaway.